With the first run of FPB 64s nearing completion we have been at work on a few options for the next group of boats, most of which are retrofittable to the first run. We have also updated the drawings closer to the real world, the originals being somewhat out-of-date. Let’s start with the back end of the boat. 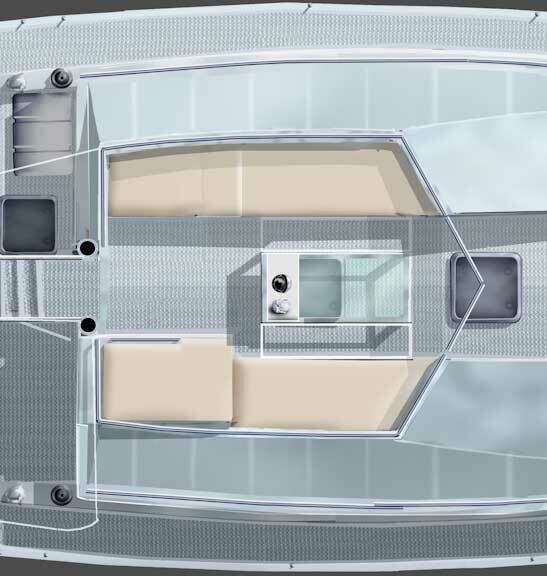 Of all the elements in an efficient hull, waterline is by far the most important. It affects drag, speed, and pitching. More is always better, except for the occasional issue of docking space and the bureaucratic hassles which crop up once you pass 65 feet/20 meters, the latter being far from inconsequential in some jurisdictions. You will note a hull extension in the drawing above. This bolt on section adds three feet/90cm to the waterline length, reduces drag six to eight percent and in some situations will add as much as a quarter of a knot of boat speed for the same fuel burn as the slower speed. 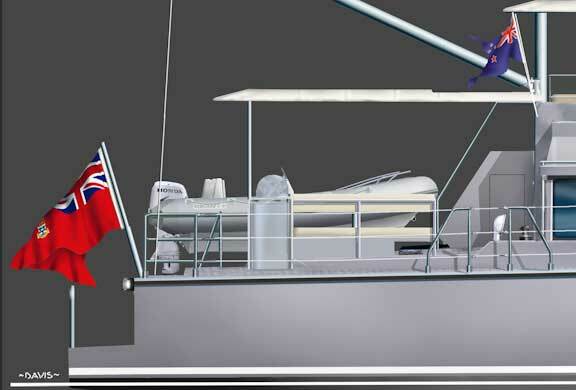 It also creates valuable space for loading/unloading passengers and stores from the dinghy, and makes possible bringing the dink alongside the swim step, head to wind, a huge benefit in choppy anchorages. We now have a secure location for a stern depth transducer, a hole which we would not put directly into the engine room. Finally, this extra waterline increases longitudinal stiffness, reducing pitching in new waves (short period). And the measured length of the hull? We will just say that the bolt on nature of the extension offers a degree of flexibility with “official” measurements not available with a welded extension. 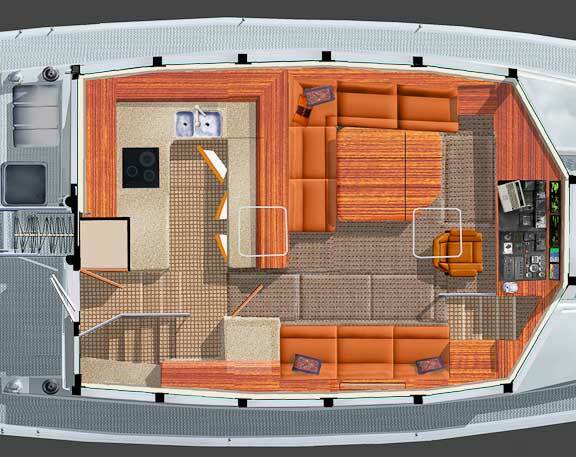 There are a couple of subtle modifications on the aft deck, as shown above and below. The aft end of the house has been extended slightly and the barBQ and sink table moved aft, which allows a slightly larger seating area to starboard in the lee of the house. This takes away space for a second dinghy at the deck level. However, a rack over the starboard deck settee will make it possible to store a rowing dinghy.The engine room air intake is now integral with the port settee. The stairs going up to the flying bridge have been pulled aft creating a landing. Rather than a stainless steel weldment the stairs are now done in aluminum, forming a storage locker for wet gear, coats, shoes, and abandon ship gear. Moving the wet locker outside frees up the inside locker adjacent to the entry landing for other uses, shown here as a galley pantry. There is a different layout now available for the great room as an option. The galley has been compressed slightly, and the salon area lengthened. If you are willing to go with a combination washer/drier, the starboard side settee can be made full length. Port and forward is a locker with two drawers and a book shelf. Galley drawer space is reduced and intrudes into the aft port stateroom into the open space over the stateroom hanging locker. The speed oven moves onto the countertop, below the pantry locker. 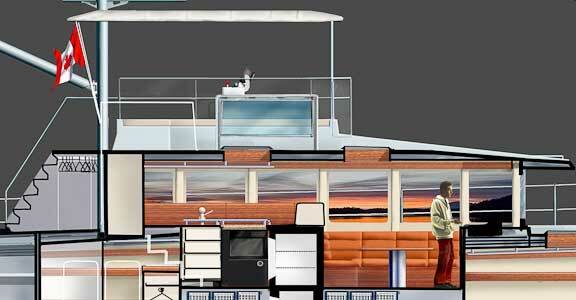 There will be an awning system offered over the aft deck which matches in appearance the awning over the flying bridge. This will provide sun and rain protection over the lower deck seating area, but leave the port side dink uncovered. If you look closely you will notice a slight difference in the profile. The flying bridge seating has been lengthened a foot/30cm. The plan view above has this added length and we have also shown a cushion on the scuttle (aft starboard corner) since this is a favorite watch standing spot in nice weather. The higher seated position on the scuttle gives you almost the same sight lines forward when seated as you have when standing at the helm. Finally, a couple of interior profile sections, closer to how the boats are being built than what we have shown you before. For information on options, delivery, and pricing contact Sue Grant: Sue.Grant@Berthon.Co.UK. This entry was posted on Wednesday, December 29th, 2010 at 12:34 pm and is filed under FPB 64 Updates, Most Popular. Both comments and pings are currently closed. Nice strategy, a few minor tweaks to an already fine design. originating at the aft end of the new extension and slopping up to join the aft most part of the deck. I think it would take on a more modern look and also become a bit more like a sailboat (got to keep the old sailors happy). It´s great anyway, congratulations ,a Happy New Year for both of you with good health and great success. We considered a topside triangle as you suggest, but it is at odds with the bolt on nature of the swimstep extension. 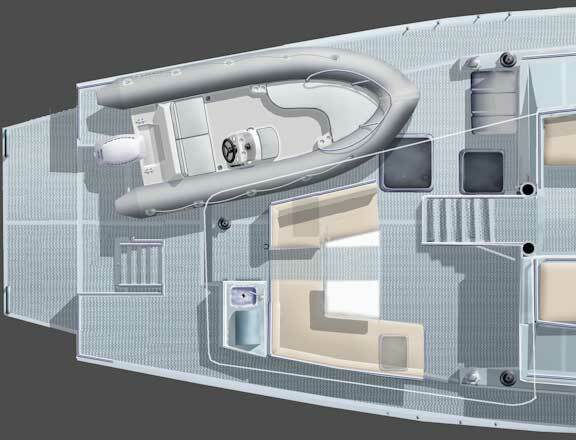 Very nice options for the FPB 64, I like them, especially the hull extention. Nice and extremely convinient to use. I just have a question, How do you manage the different exhausts (engine, genset) through the “bolt on” extention of the hull ? Have a very happy new year for both of you and thanks for sharing your journey, it’s always a great pleasure to see it and keep the dream alive. The extension has pipes for the various exhausts welded through it. I’ve no experience with a boat long enough for this to be a consideration. What jurisdictions in the US and Carribean would this affect and what would the inconviences be? I assume that in some harbors a Pilot would be required. Anything in addition to that? The main issue with 20M and above is in some areas a pilot is required, in others you are considered a ship and required to stay in the shipping lanes if traffic separation schemes are in place. There can also be different rules on the type of toilet systems required. In the US, for example, Alaska requires a pilot or costly exemption if you are not US flagged. Another note regarding “bureaucratic hassles over 20M” include insurance rates and policy restrictions which increase significantly with vessels over 20M. On Hoa we do the same : “stay just under the fatidic 20m lenght”! 1. Why does FPB 64 has treadmaster on the deck and not aluminium tread plate like FBB 84 ? 2. Why does FPB 64 has carpet and rubber on the floor inide in stead of the beautifull wooden floor with non skid system in FPB 84 ? 3. Osprey FPB has an stern hull extension, so does Iron Lady FPB 64 but this one has heavy duty hatches, what is the purpose of those hatches ? Treadmaster is used on the FPB 64s because it gives a better grip under foot, and is also smarter looking. 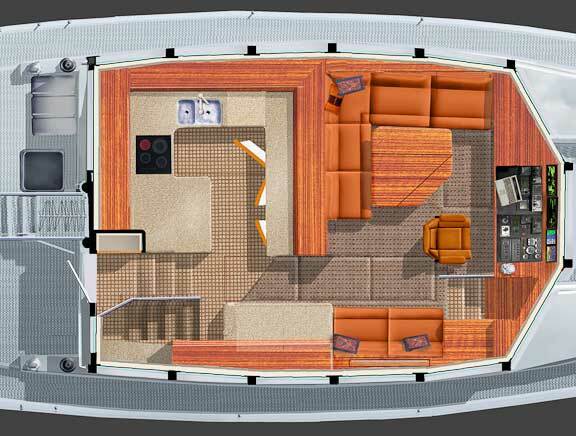 The cabin soles are more practical and perhaps $100,000 less expensive. They are also very handsome in our opinion. The extension on Osprey is of the boarding platform. On Iron Lady this is a bolt on tnak, or section of hull, and the hatches are for access. hi steve and linda, i cant help wondering if this bolt on extension has anything to do with engine placement and pitching moment. We originally wanted to keep the FPB 64 under 20 meters due to various regulations that take place above this length. However, most of our clients have decided they would rather have the bigger swimstep and the increased efficiency. The bolt on system provides a method of getting back under 20m if desired. Steve has anyone considered or installed a Seakeeper Gyro instead of fins ? beside the cost is there any reason not to install this Gyro ? The Seakeeper gyro is not as suitable across a wide range of ocean going wave trains and/or chaotic environments as are active stabilizers. There are also the constant power requirements at anchor. Our boomed at anchor flopper stoppers are more effective with no power drain. But if you do not have a boomed system, and are generator dependent, than SeaKeeper gyro might make sense at anchor. 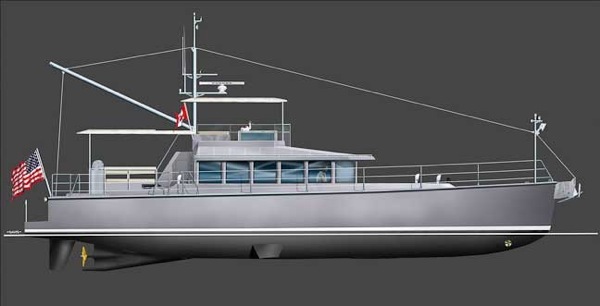 considering the hull extension, do you see this design being able to carry even longer extension? Say twice what you have now to making it around two metres, with proper massive fin-friendly diveladdder and handholds would make a fantastic dive-platform (with FPB64’s low draft most dive sites can be reached directly, no need for annoying dinghy ferrying any more), also making landing a dinghy in bigger waves much easier and maybe also cut the drag few percent by extending waterline. 3rd series option maybe? Also do you think the whole hull extension is or can be made strong enough to consider bolting the get-home drive leg into it? I would think so. I quite start to like the hydraulic drive leg option, if it is stand alone system it is quite simple (relatively), normally stowed away so whale and grounding proof, quick to deploy, and as an added bonus it is 360 deg turnable so with remote control you would have atzipod-class manoverability, even in the rare event of rudder failure. Re swim step extension length, there are many tradeoffs, one of which is the increase in stiffness fore and aft and its impact on pitching. That said, if you are willing to pay some uphill motion penalties the extension could be longer. We have looked at hydraulic drive legs for get home and prefer the system in use for man reasons. Steve, this pitching “heaviness” was what I was suspecting also. Might not be that bad though with your sailboat-like bow design. Regarding the hydraulic get home, a sealed and dedicated closed loop system with variable displacement pump and fixed displacement motor should be more or less maintenance free for years of (ab)use, as long as loop is kept sealed, well cooled and contaminent free. 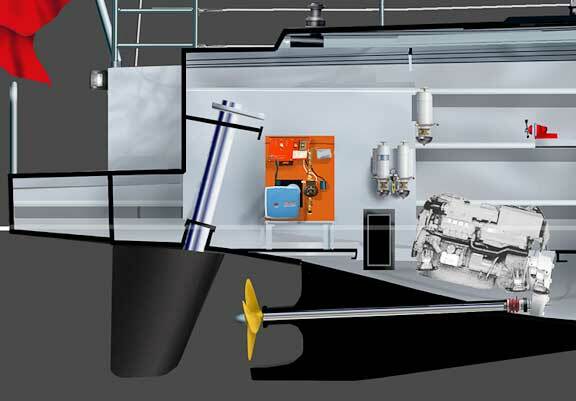 There are only so many connectors after all, only few meters of piping (from engine room corner where say 80kw size aux engine sits, to stern, and to keel? cooler or heat exchanger) and no complicated valves. Also I have been doing some back of the envelope calculations on this, propulsion wise the reduced efficiency should be greatly offset by ability to independently and freely fine tune propeller RPM and engine loading to their respective sweet spots. Because of this the system could even use the same/spare prop as main engine for this. If only a solution could be found for main prop drag, then this system could probably be used without much range penalty at all, just by trading speed. Maybe time to invent something crazy, like hydrodynamic covers iover the main prop blades? Have to think this more.